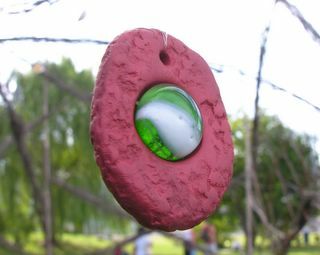 The air is heady with the fragrance of cardamom, cumin, roses and incense. 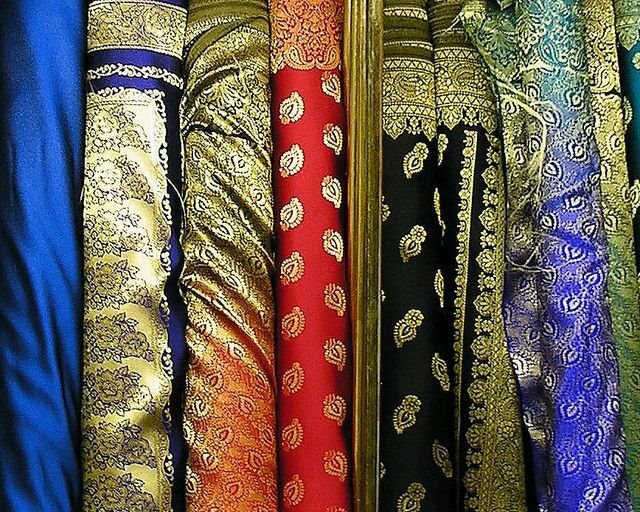 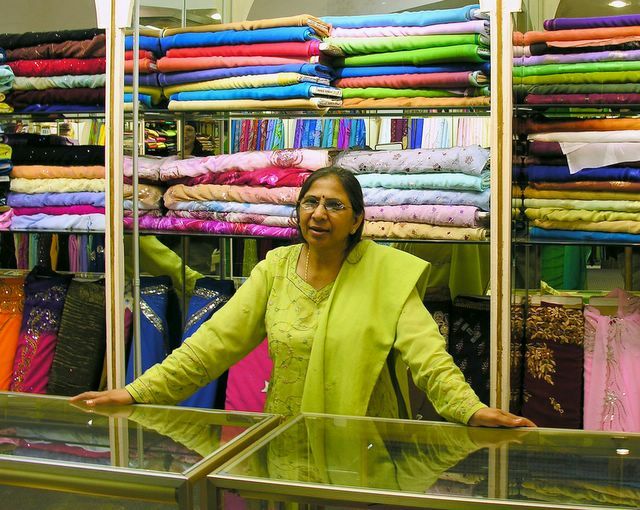 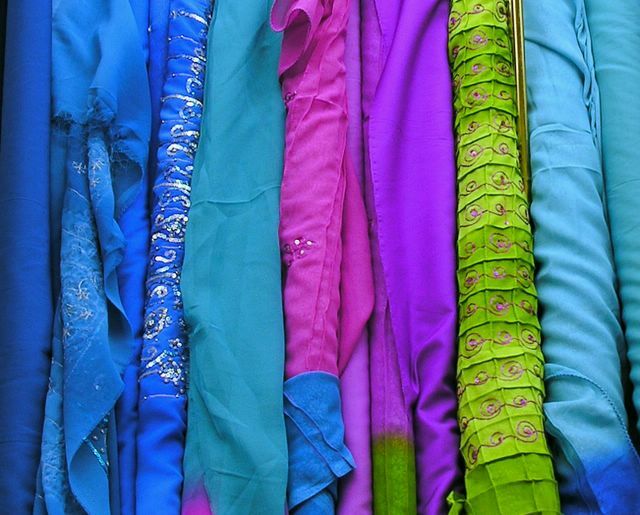 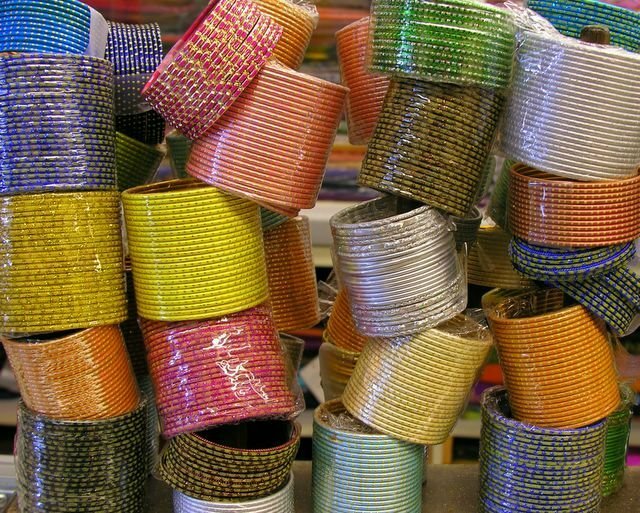 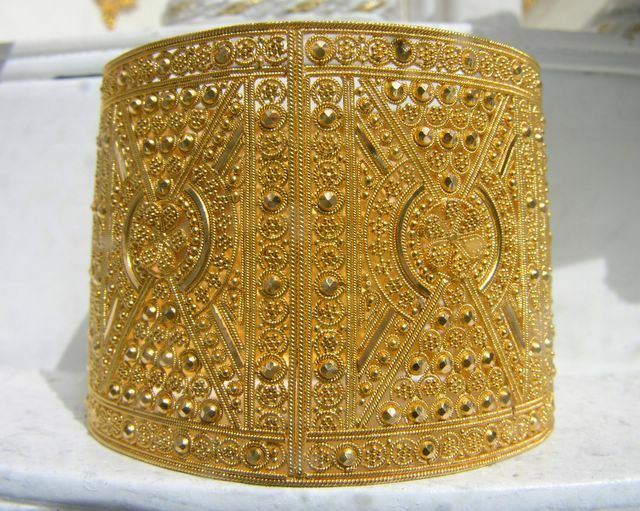 The markets are crowded with women clad in flowing saris and men wearing caftans and intricately-wound turbans. 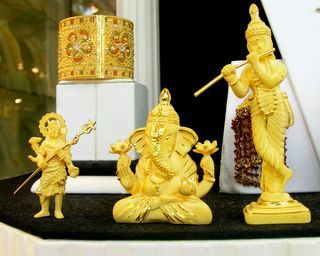 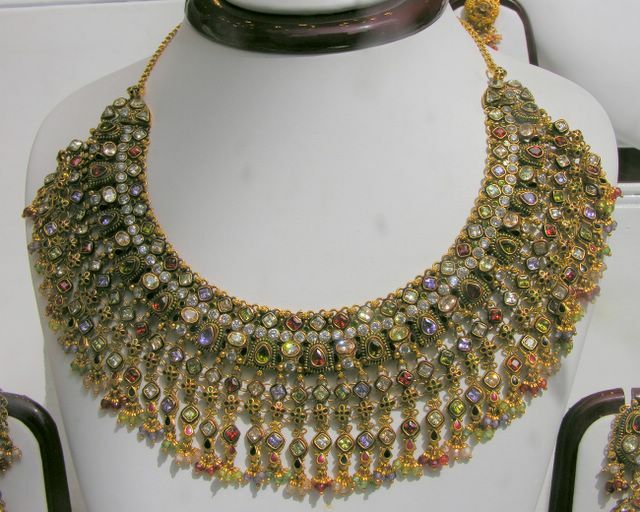 Shop windows display glittering gold jewelry, statues of Krishna and lacquered sitars. 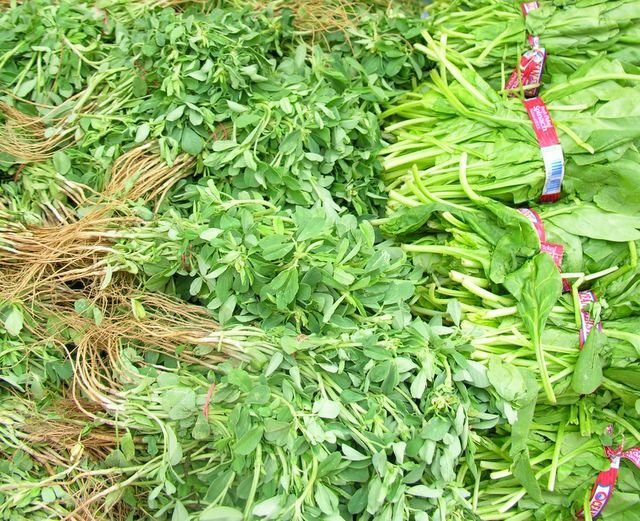 Sidewalk vendors proffer bunches of fresh herbs, sticky sweets and copies of the Koran. 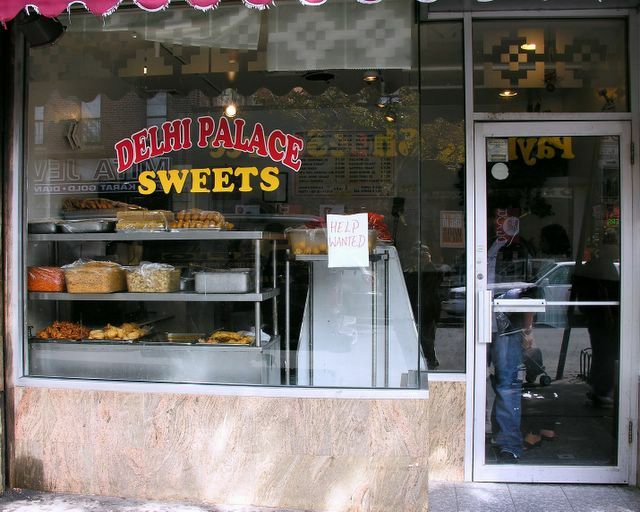 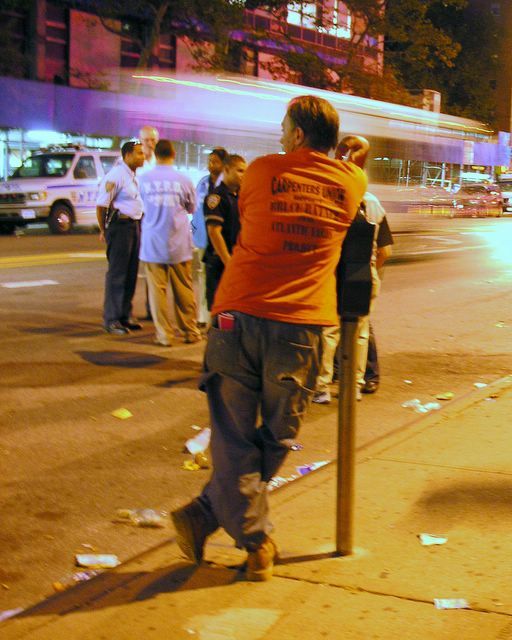 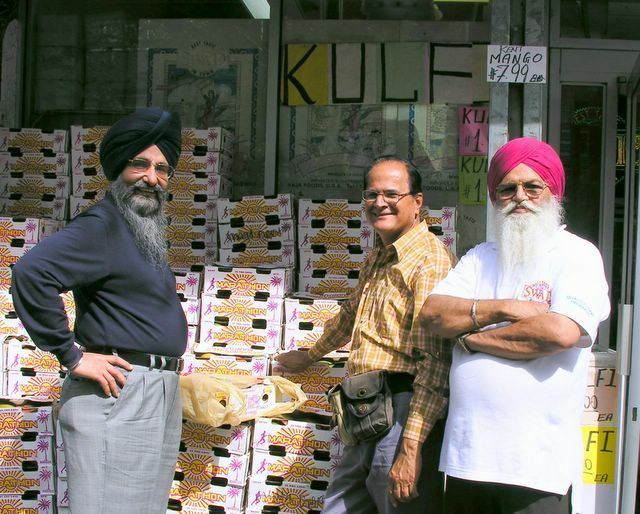 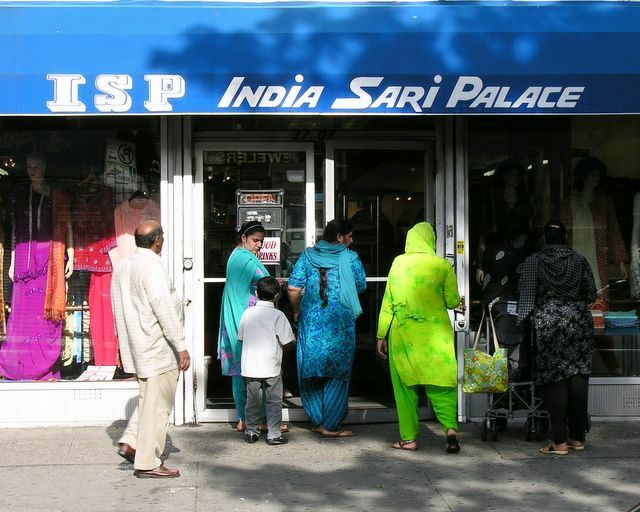 This is Jackson Heights, also known as Little India. It has been said that this section of Queens is not really like Bombay (or even Mumbai) because there are no cows wandering the streets. 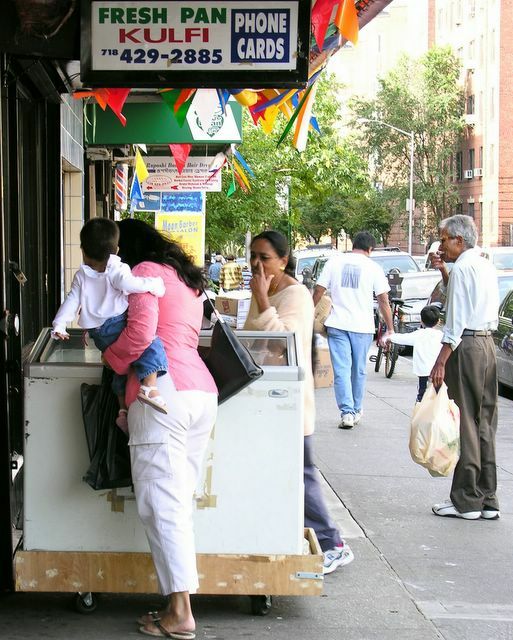 But Little India certainly isn’t like anyplace else in the United States. 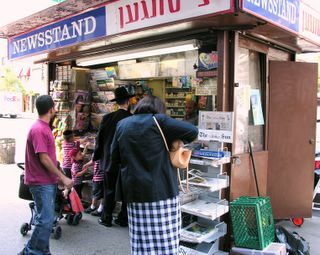 This is the place to go for books, newspapers, CDs and videos in Urdu, Hindi, Tamil and Gujarati. 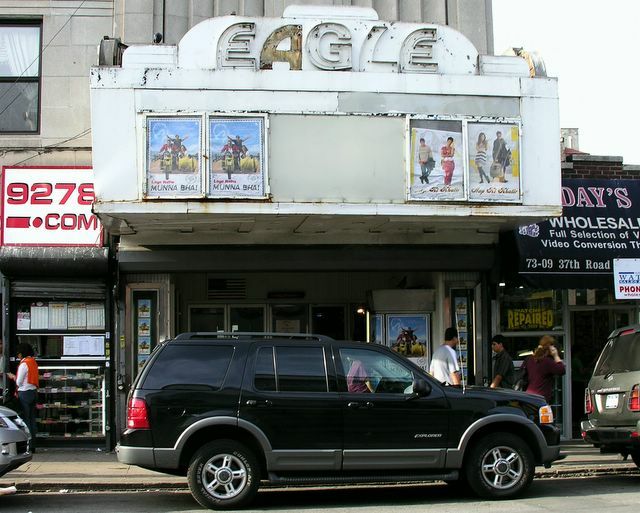 Catch the latest releases from Bollywood at the Eagle Cinema. 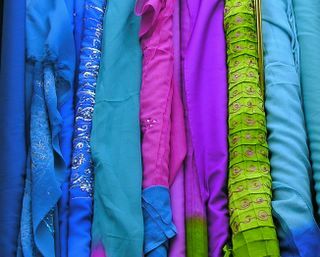 Bang on a tabla, have a salwar kameez made to measure, fill your arms with colorful glass bangles, get a mehndi tattoo, drop a coin in a beggar’s cup, have your eyebrows threaded or your handlebar moustache groomed. 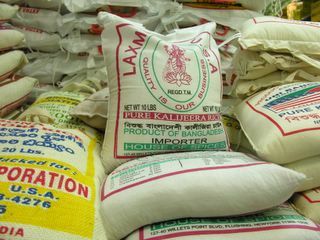 The grocery stores and pushcarts overflow with the spices, herbs, fruits and vegetables of India, Pakistan and Bangladesh. 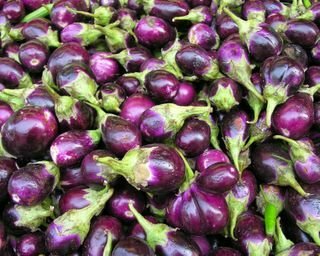 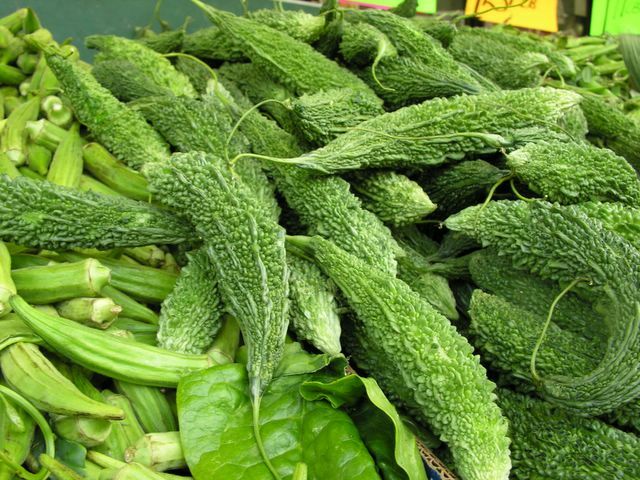 Intrigued by curry leaves, purple yams and ridge gourds but unsure what to do with them? 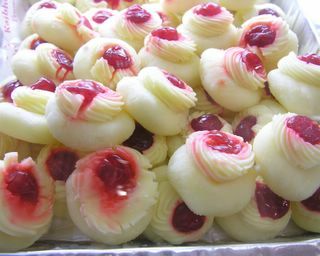 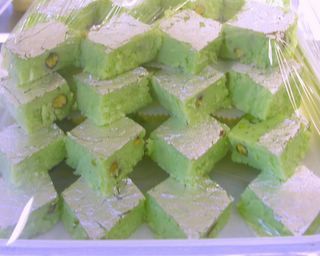 Just ask (you’ll be inundated with “secret” family recipes) or leave the food in the hands of the professionals and fill yourself — cheaply and deliciously — at the local sweets shops and restaurants. Strolling through Dumbo one Sunday, I came across a wooden construction barrier painted with white flowers and took a few pictures. 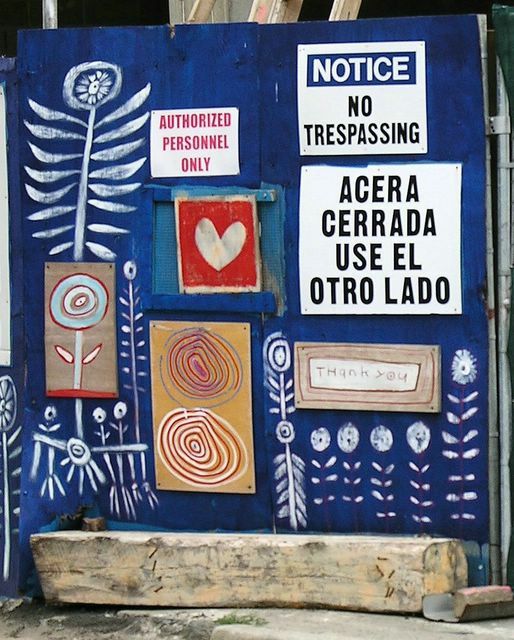 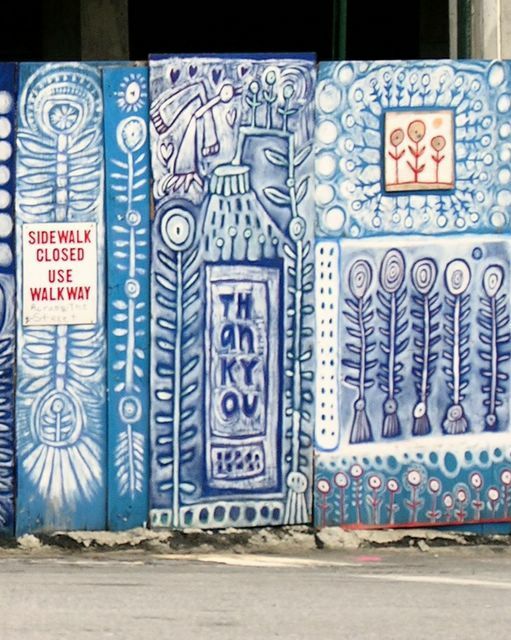 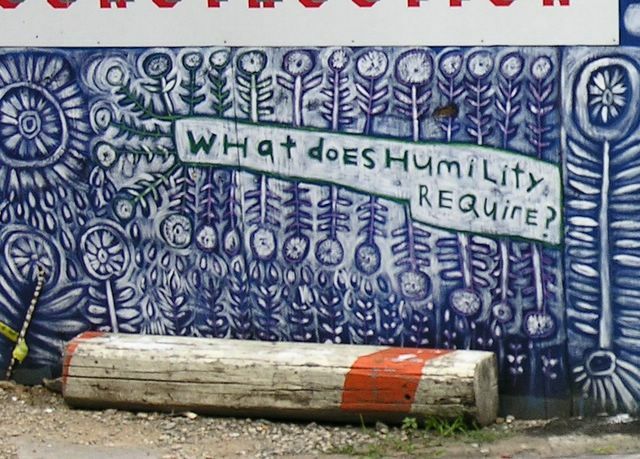 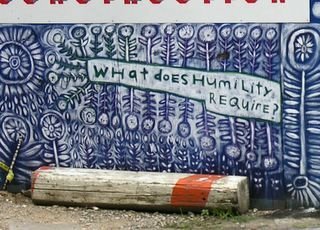 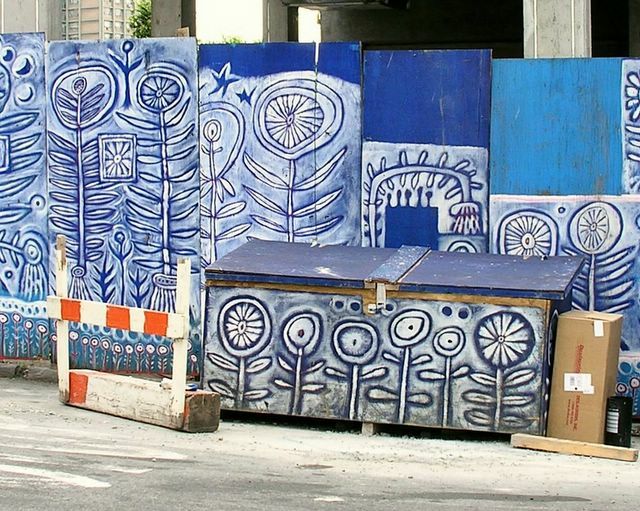 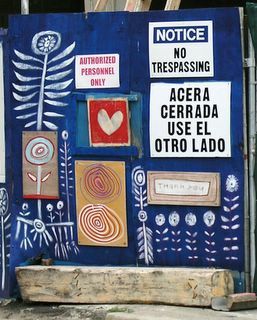 About a month later the New York Times published an article telling the story of this fence, the construction workers laboring behind it and Pasqualina Azzarello, the artist who made transformed bare boards into a garden down under the Manhattan bridge overpass. In the decade or so since big developers “discovered” Brooklyn, sections of our community have changed radically. 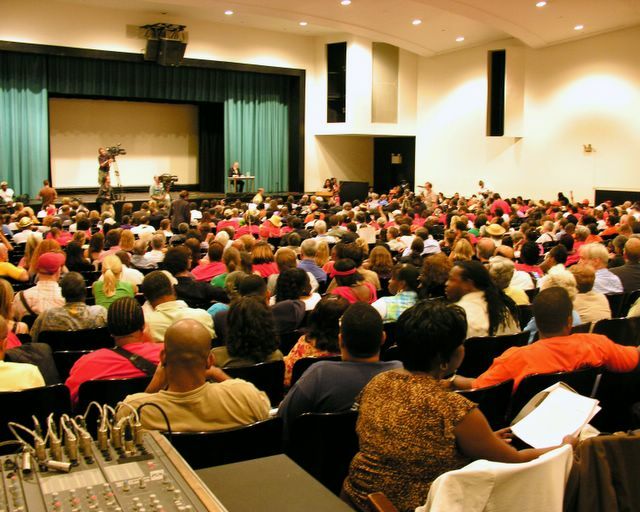 Right now, one company’s building plans are generating the biggest political ruckus seen here in decades. 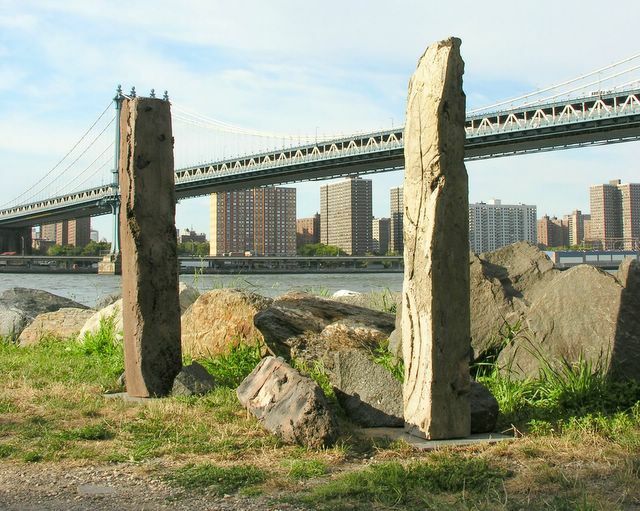 Forest City Ratner Companies wants to erect Atlantic Yards, a 22 acre complex including offices, apartments and a professional basketball arena. 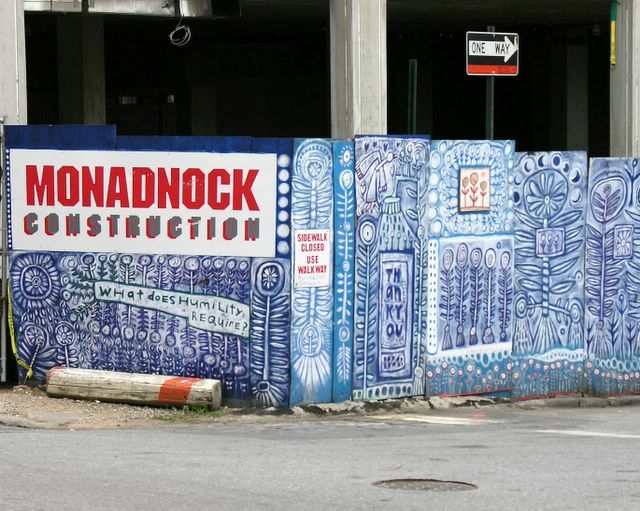 If constructed, the $4.2 billion Frank Gehry-designed project will add 16 highrises and 7,000 units of housing to what is now an area of lowrises and brownstones. 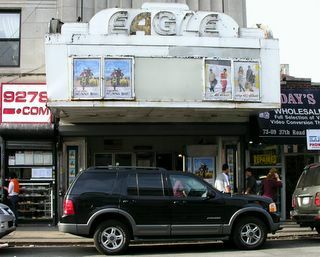 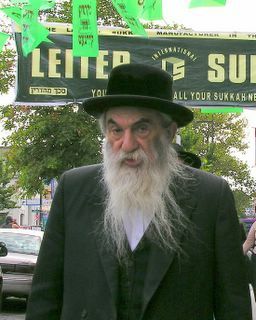 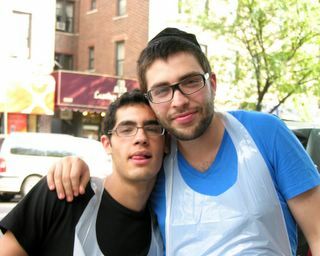 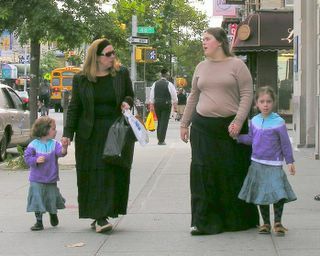 Borough Park is a neighborhood largely shaped and defined by its large population of Hassidic Jews. 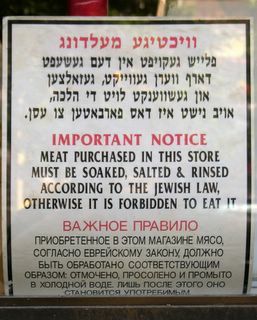 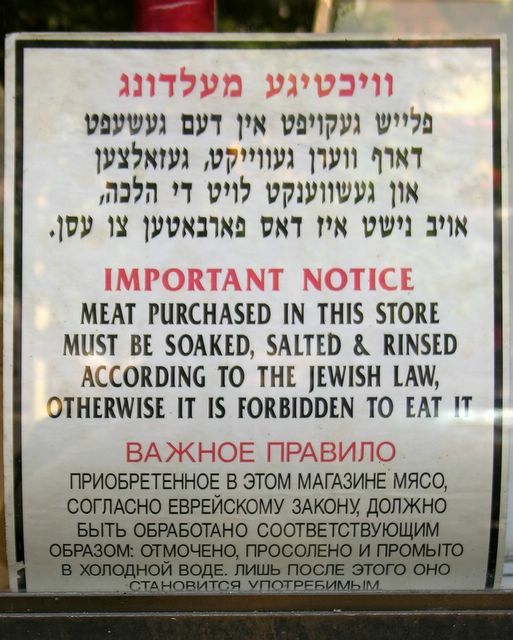 Last spring I visited on a Friday afternoon when the area’s businesses shut down to prepare for Shabbos, the Jewish Sabbath (see Erev Shabbos in Borough Park). 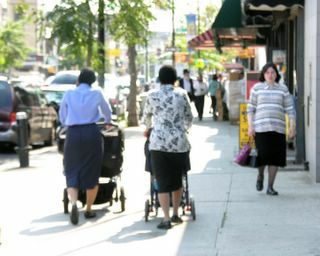 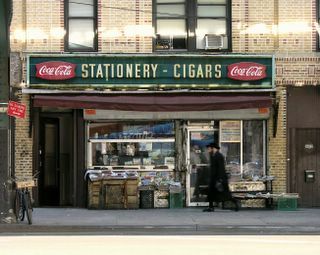 In sharp contrast to the stillness and quiet found here at Shabbos, during the business week Borough Park is bustling. The busiest street, 13th Avenue, is lined with hundreds of mom-and-pop shops and restaurants. 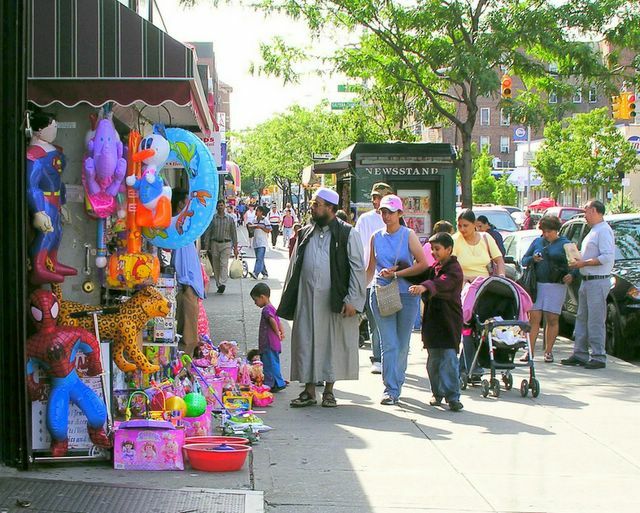 It doesn’t take many mothers pushing strollers to fill the aisles of these small stores, so on a sunny day most of the shopkeepers move racks, tables and boxes of merchandise outdoors. 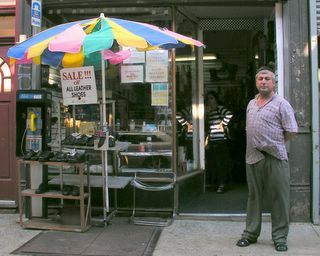 Their sidewalk displays serve to both promote the business and make more room inside. Everything from earrings to suitcases to toys can be purchased curb-side, giving the district the air of a gigantic stoop sale. 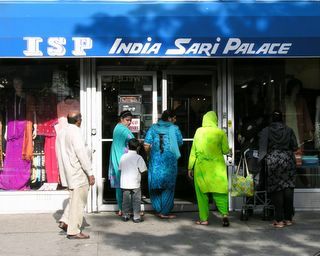 The prices aren’t far above those of a stoop sale, either. 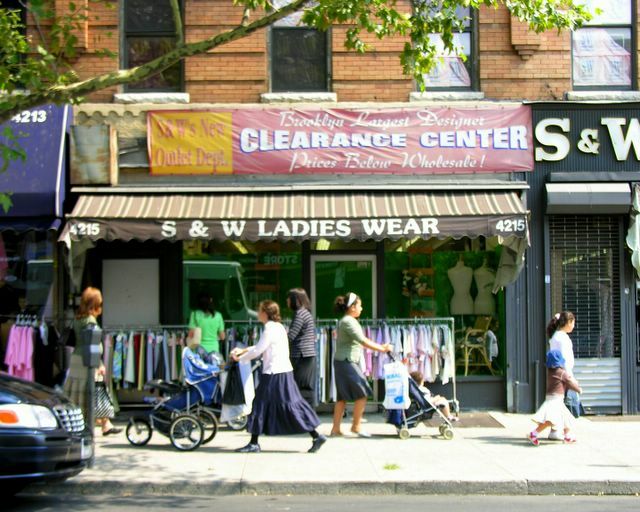 While some stores cater to the needs the religious community, dozens of places offer deep discounts on designer and name-brand goods, particularly women and children’s shoes and clothing. 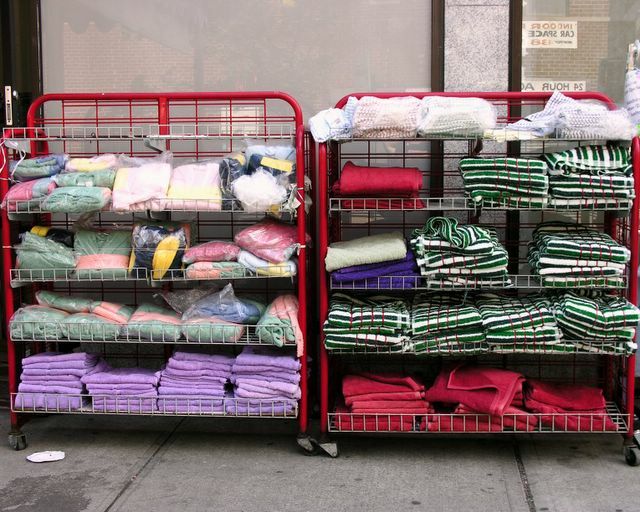 Buy a few items and be prepared to be offered a discount — or just ask for one. 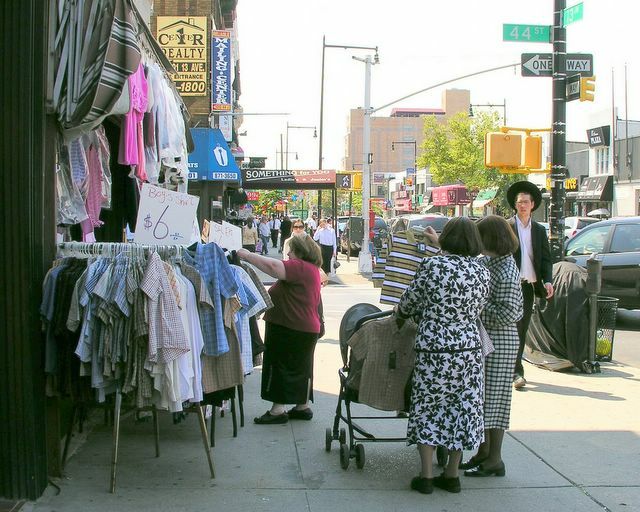 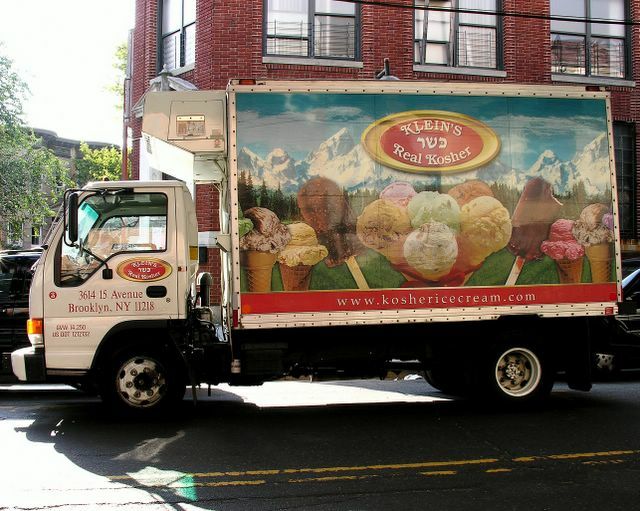 In addition to shopping, Borough Park is a great place to practice your bargaining skills. 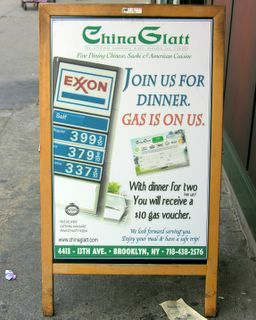 Join us for dinner. 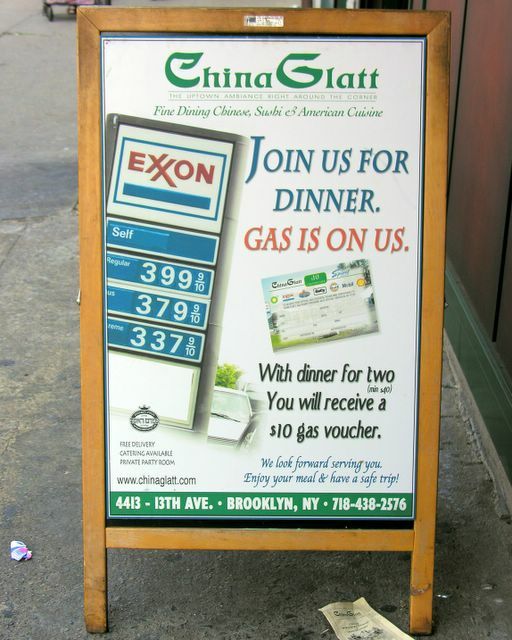 Gas is on us. 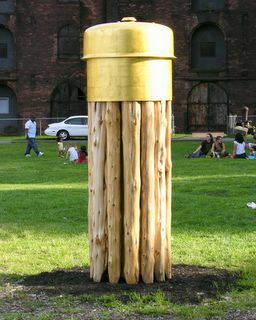 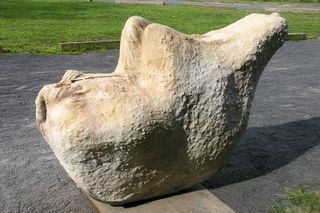 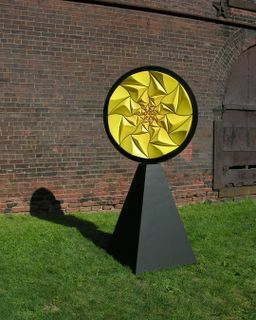 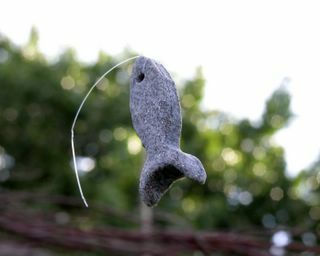 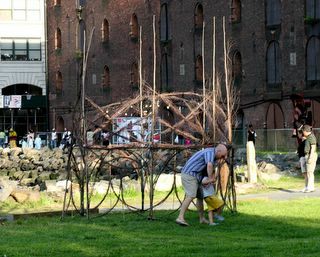 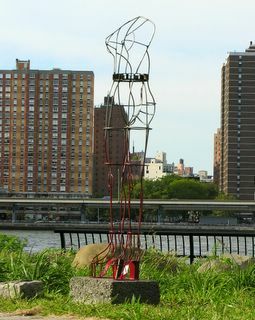 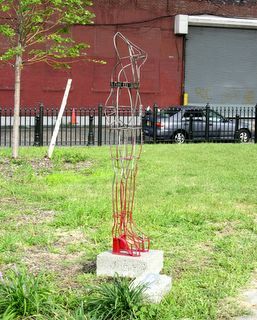 More from the Garden of Delights show, these sculptures are in Empire-Fulton Ferry State Park. 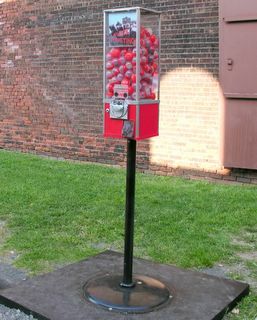 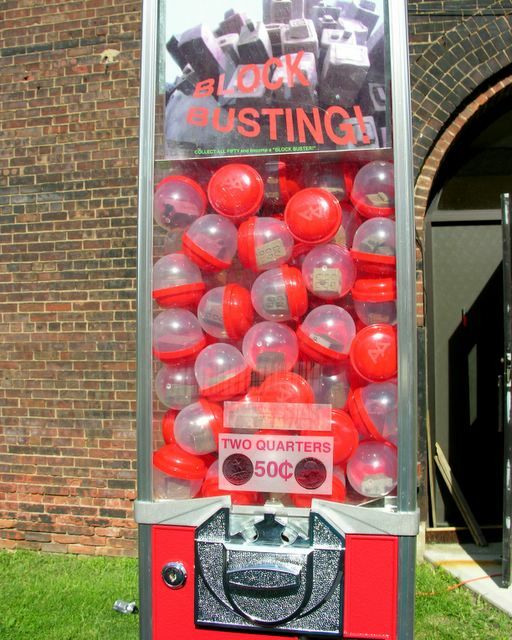 George Spencer’s Gumball Machine actually works; insert two quarters, turn the lever and you’ll receive a plastic dome containing a tiny clay building. Hurry over to the park and you, too, can own an authentic Brooklyn brownstone for only 50¢. 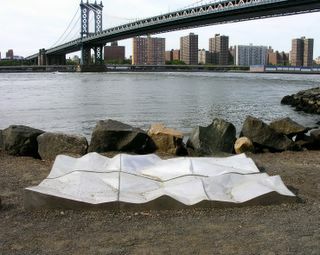 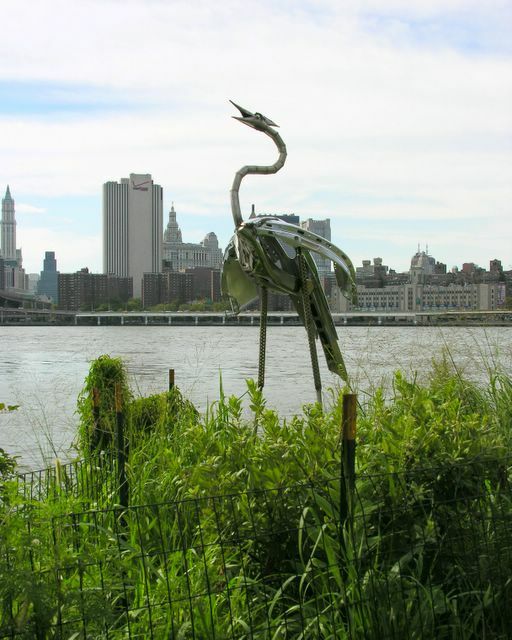 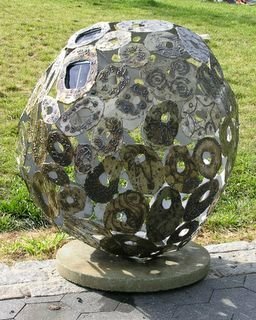 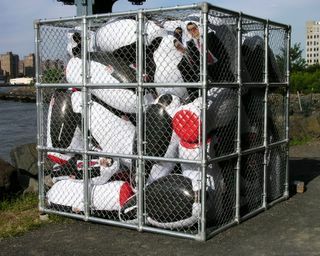 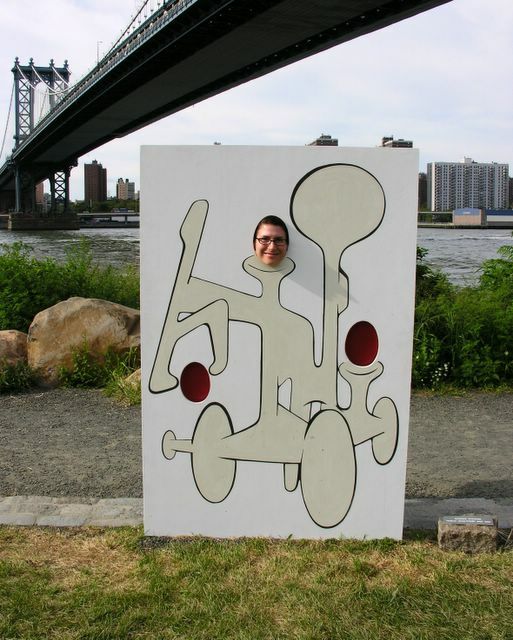 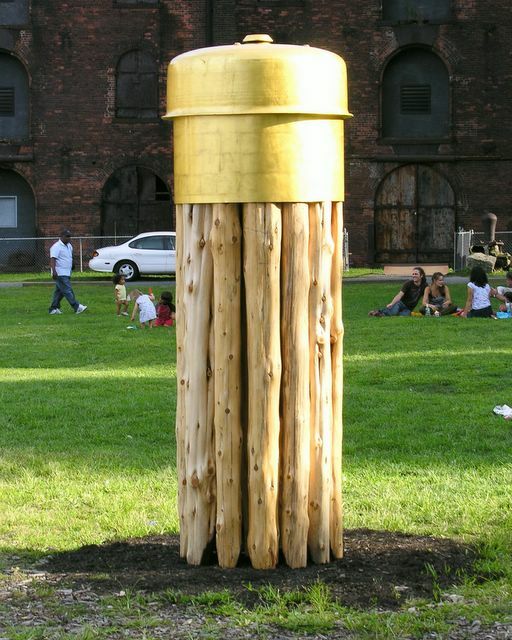 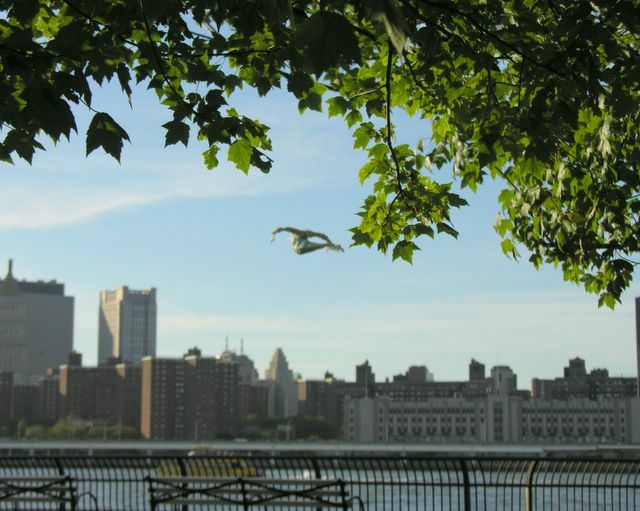 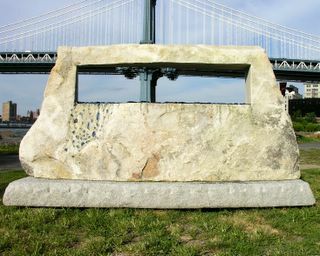 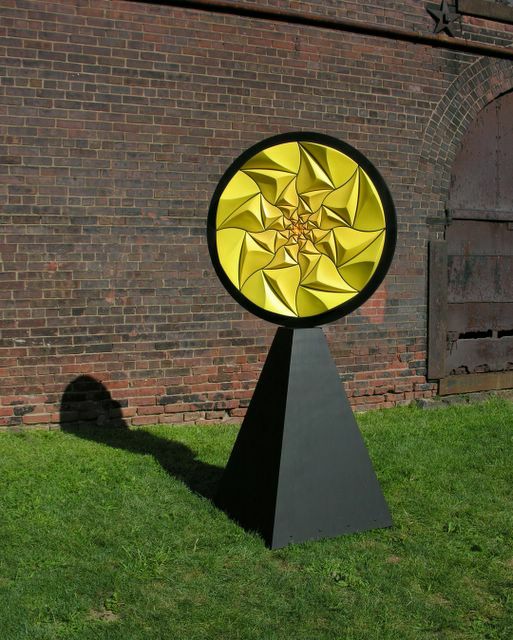 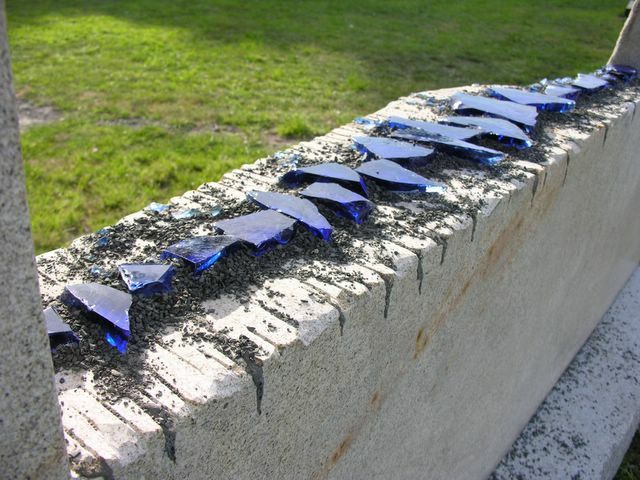 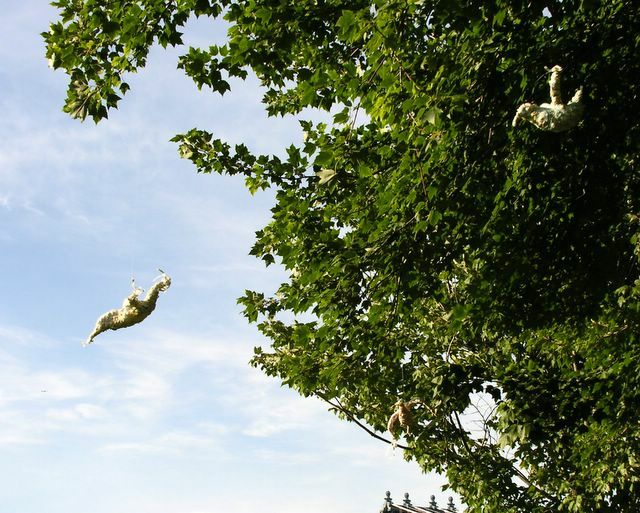 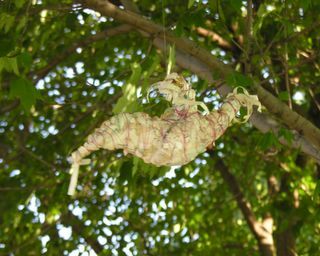 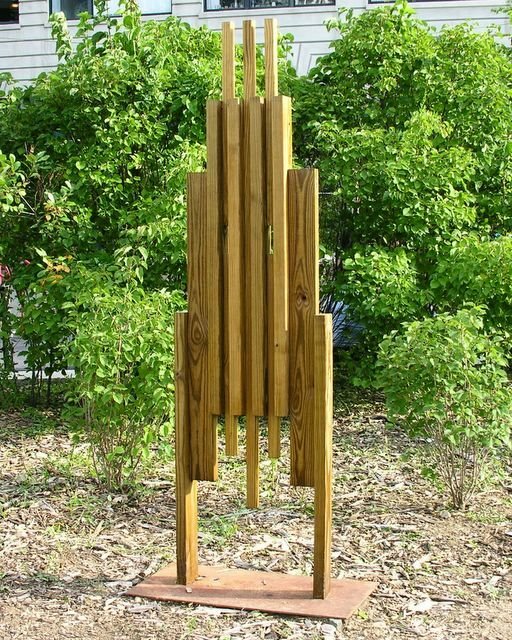 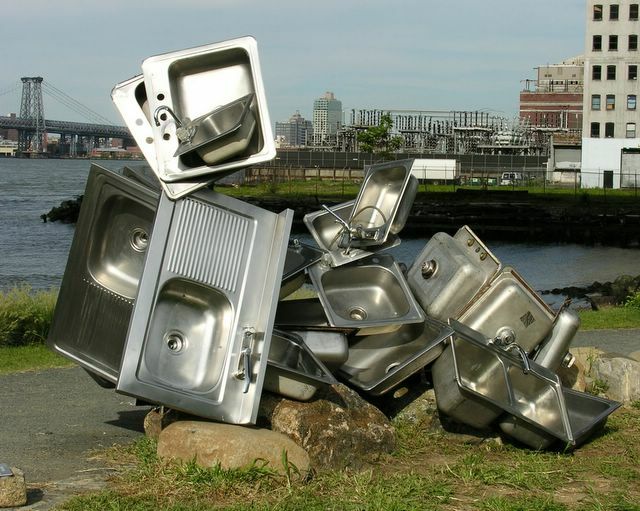 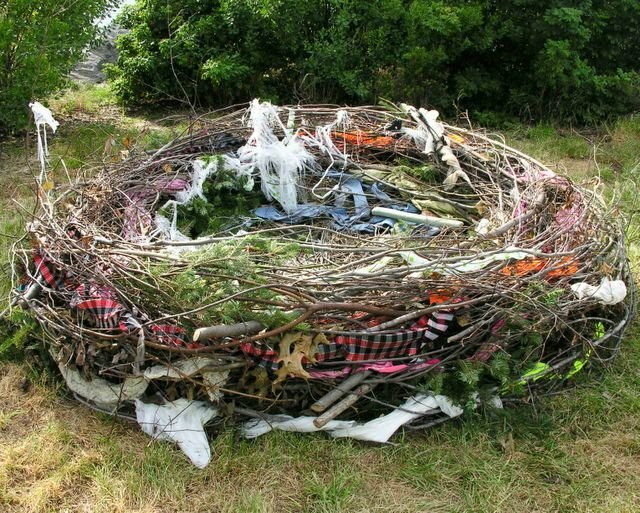 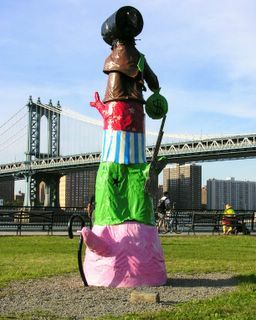 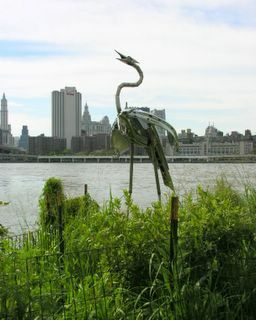 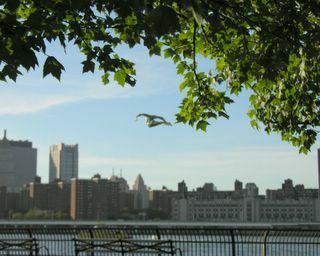 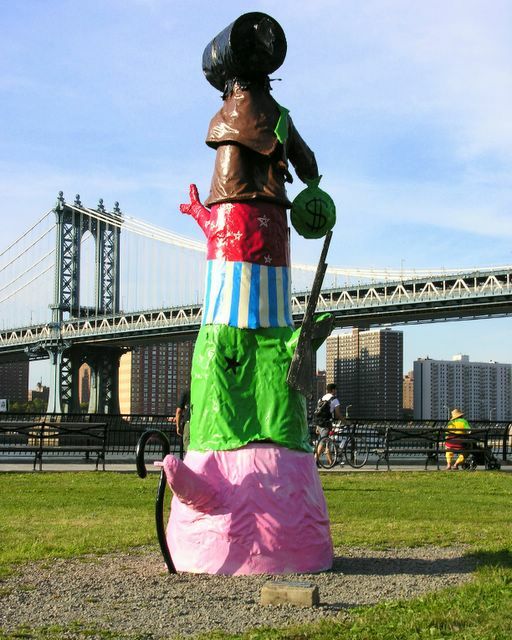 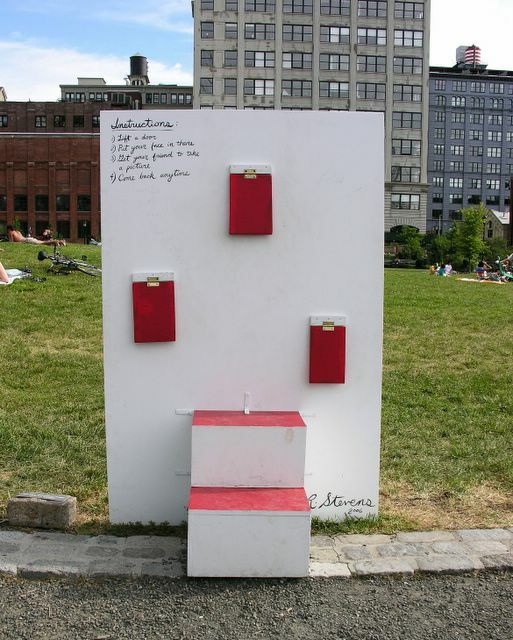 Garden of Delights is the 24th annual outdoor sculpture show organized by the Brooklyn Waterfront Artists Coalition. 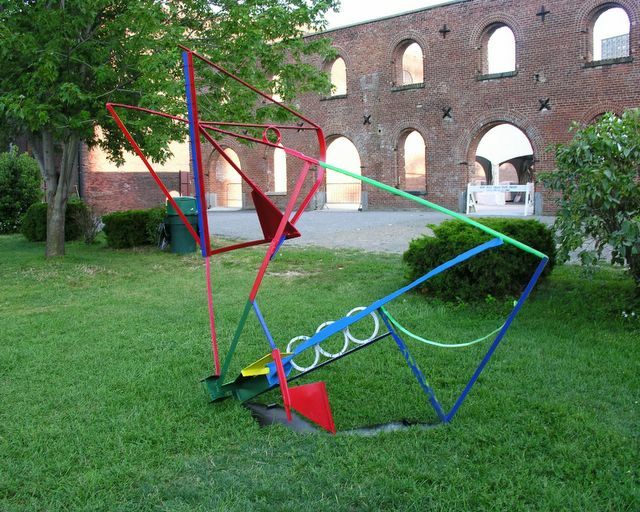 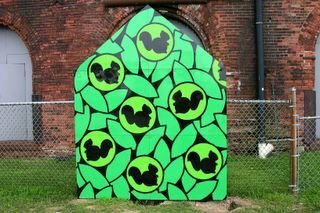 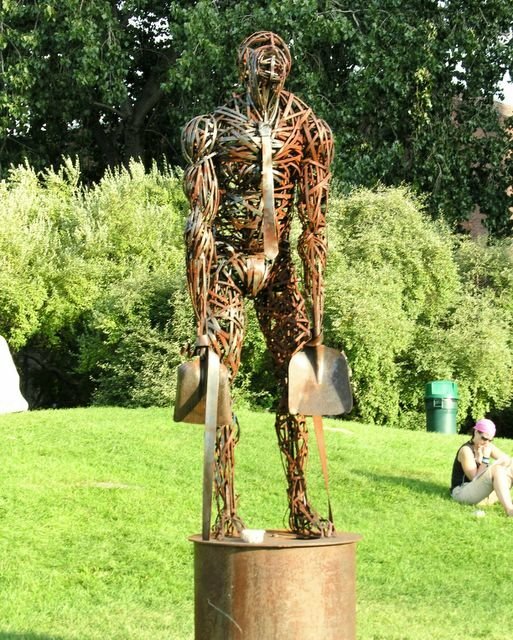 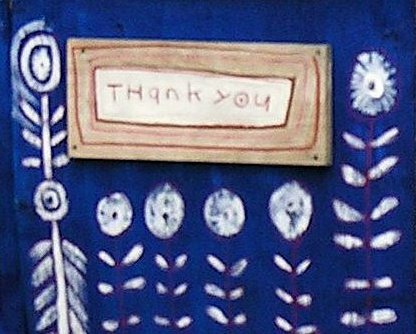 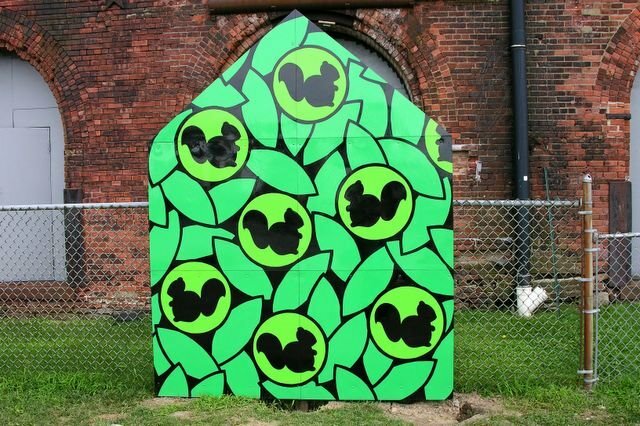 About 25 artists from around the country contributed work that will remain on display in two adjoining public parks until October 13. 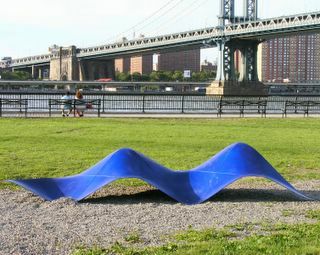 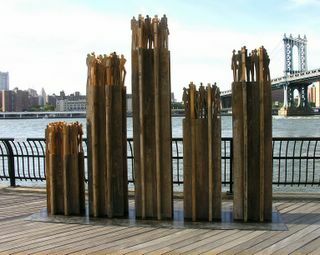 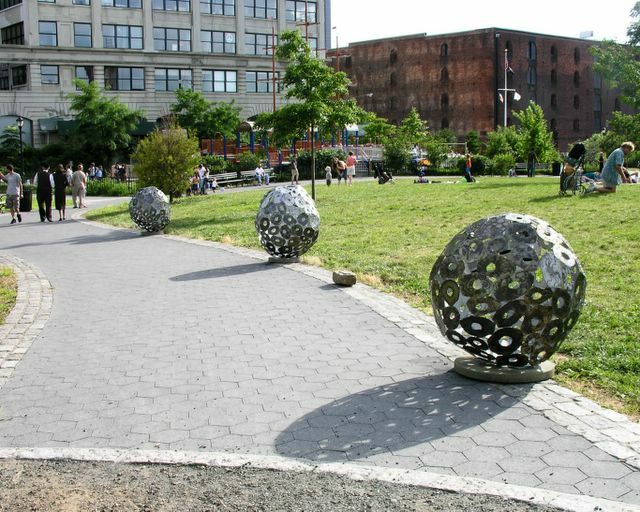 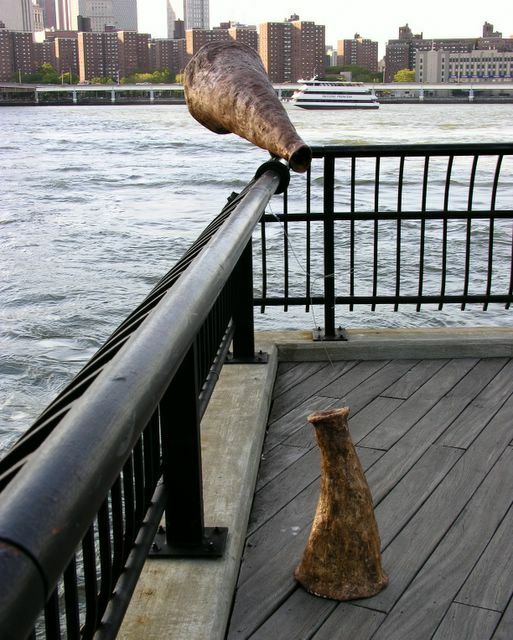 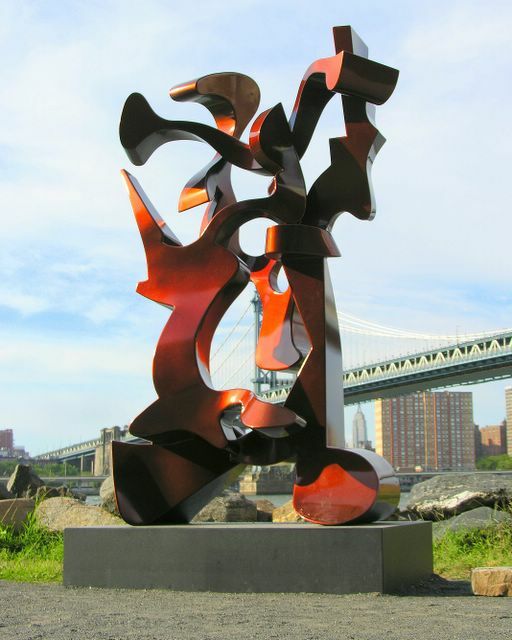 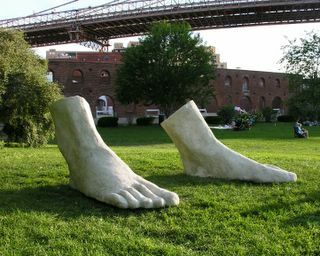 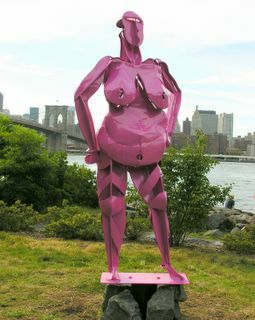 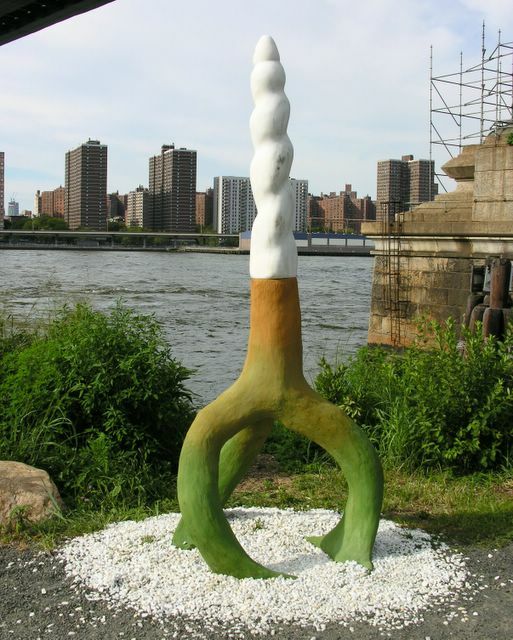 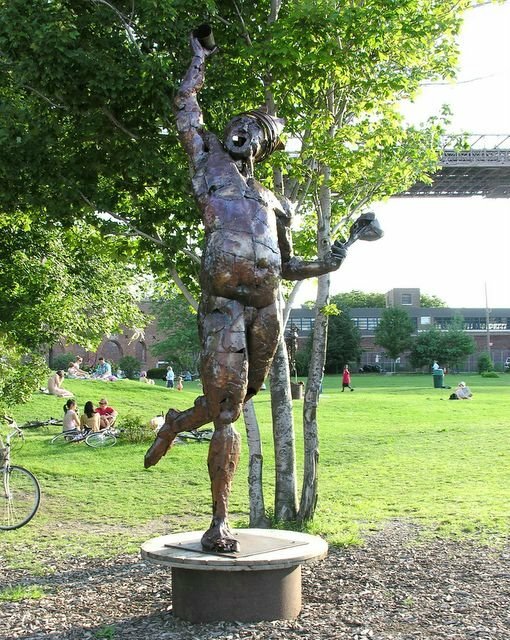 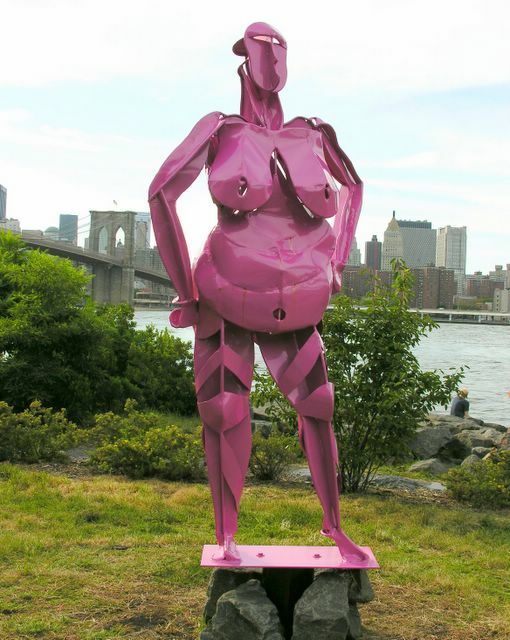 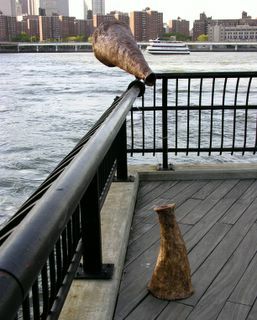 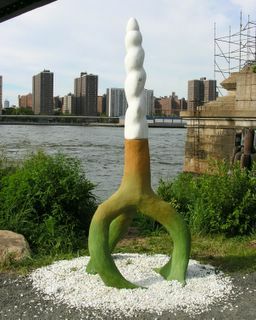 These sculptures are in Brooklyn Bridge Park. 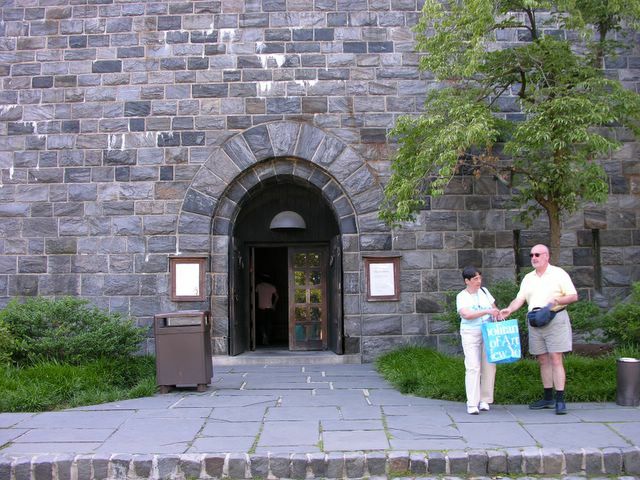 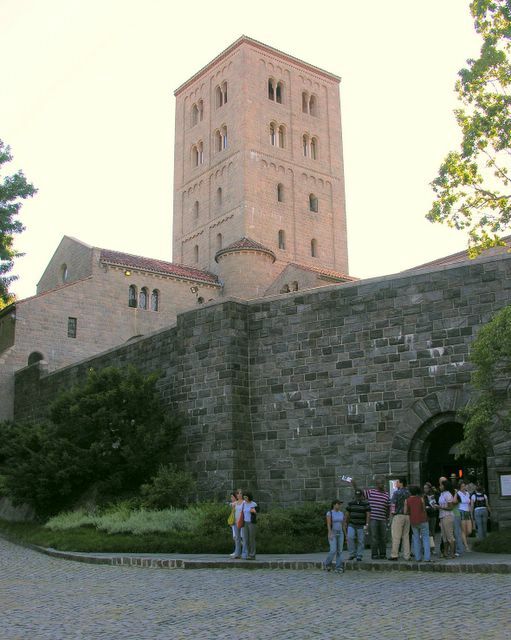 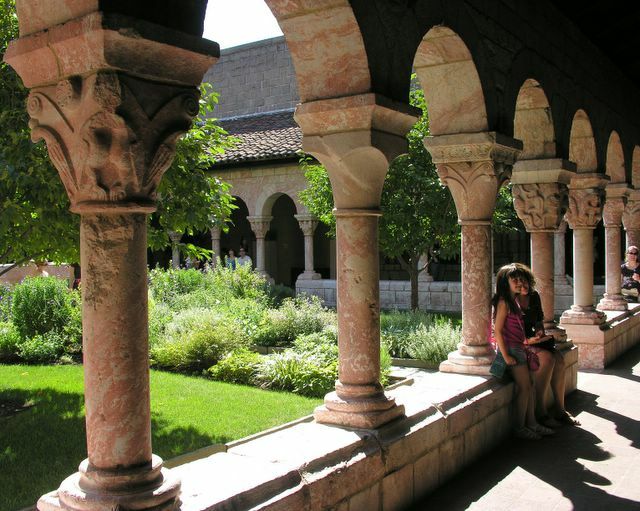 High atop a hill at the northern tip of Manhattan Island stands the Cloisters, the branch of the Metropolitan Museum devoted to the art of the middle ages. Constructed in the early 20th century, the fortress-like building was inspired by medieval structures. 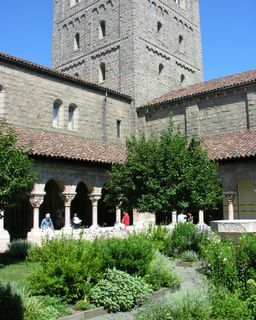 The setting, structure and core of the collection were gifts from oil magnate and philanthropist John D. Rockefeller, Jr. to the people of New York. This building incorporates chapels, halls, rooms and architectural elements from Europe. 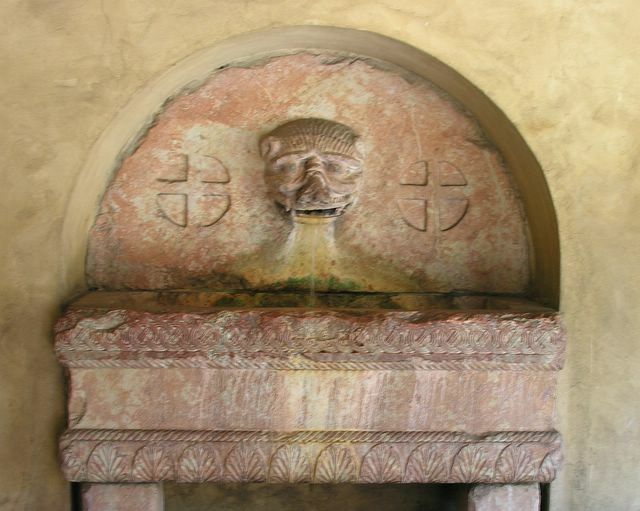 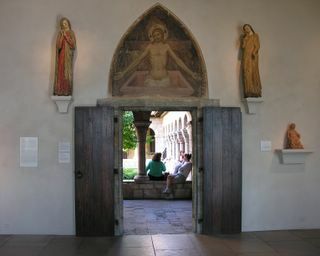 The ancient stone portals, windows, columns and fountains allow many of the items on display to be shown in settings similar to their original situations. 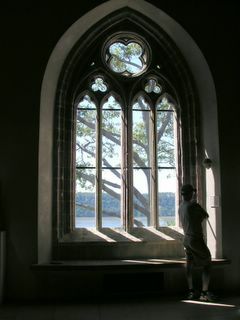 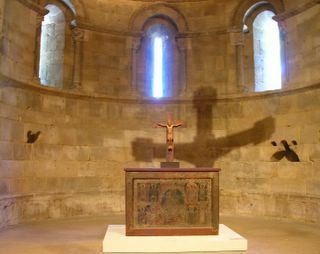 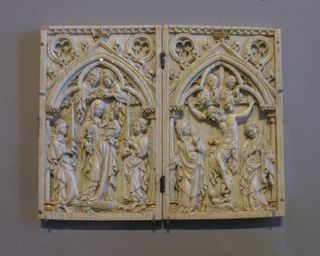 Visitors don’t simply view a wooden crucifix hanging against a white gallery wall; they see it displayed in a stone chapel, illuminated by sunbeams streaming through stained glass windows. 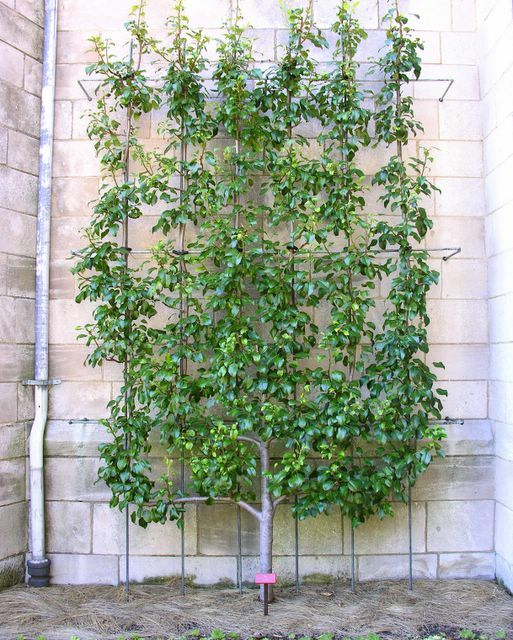 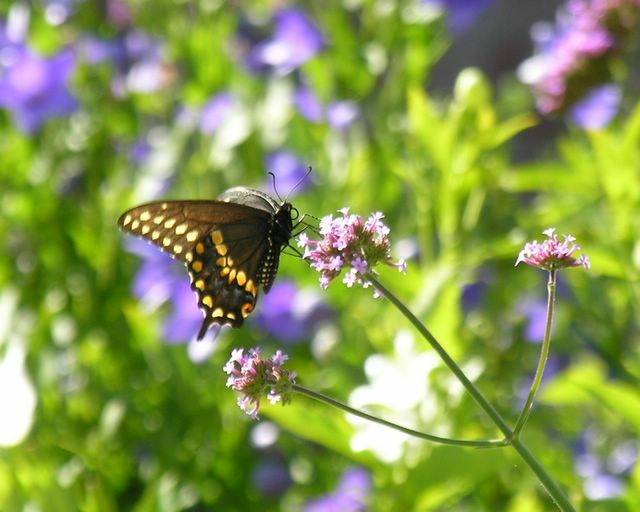 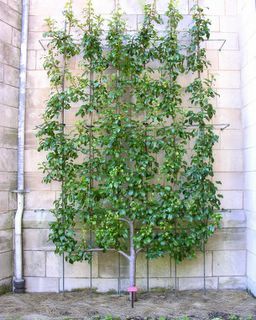 The museum also features three enclosed gardens, including an herb garden containing more than 250 species that were grown during the Middle Ages. 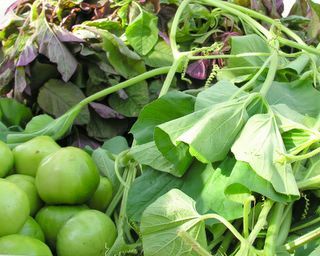 The plants, grown in beds and large pots, are grouped by their intended use: household, medicinal, aromatic, kitchen and seasoning, salads and vegetables, plants used by artists, magic plants, those associated with love and marriage. 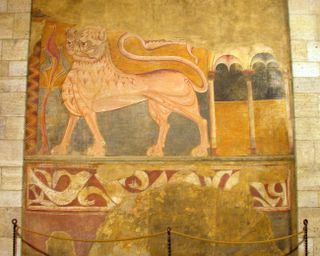 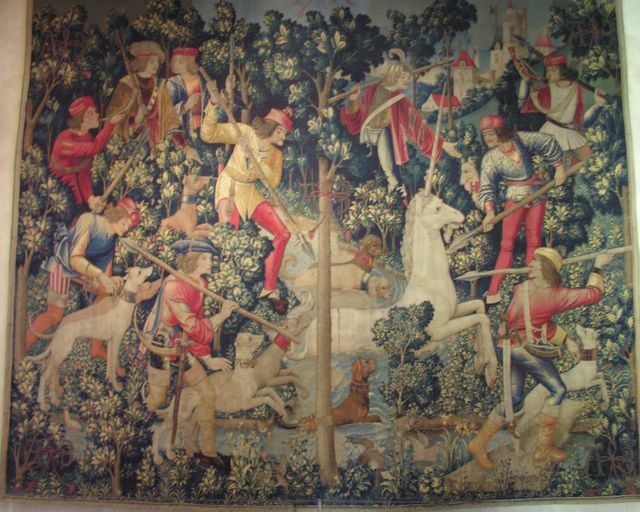 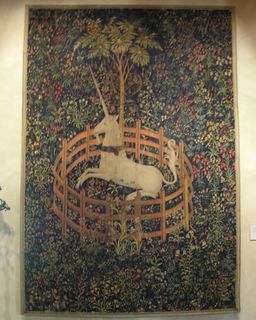 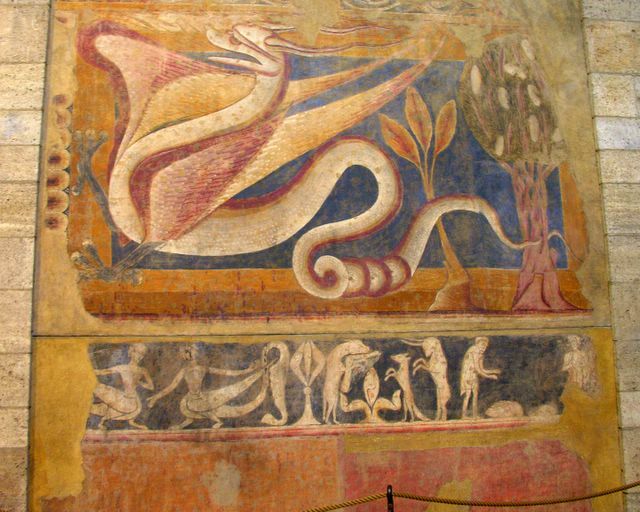 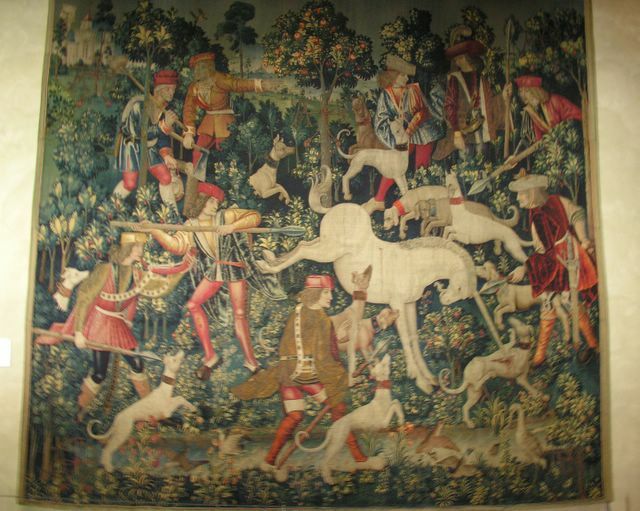 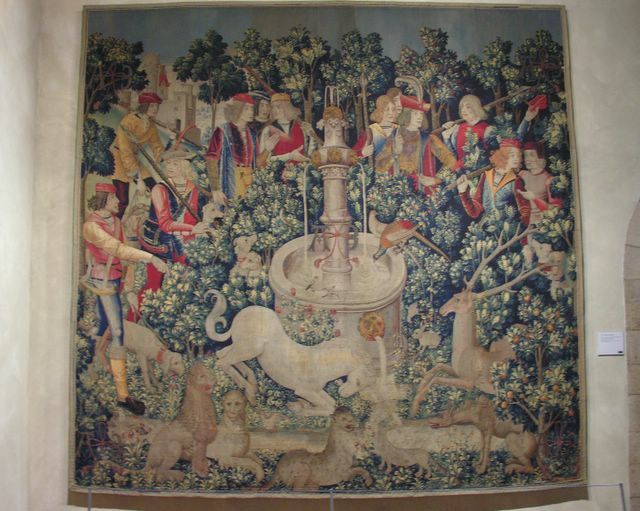 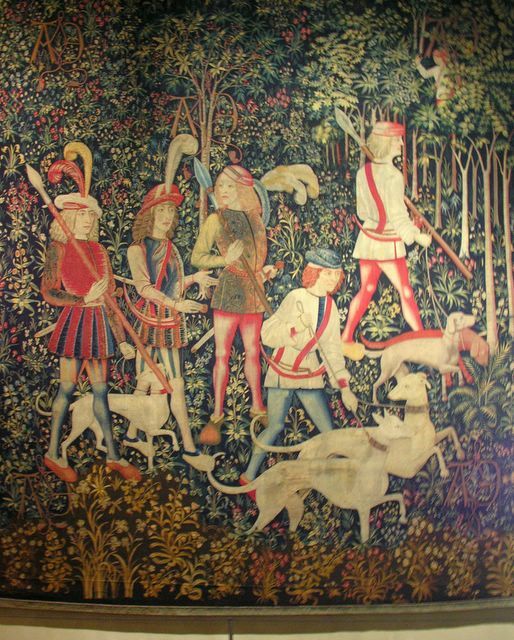 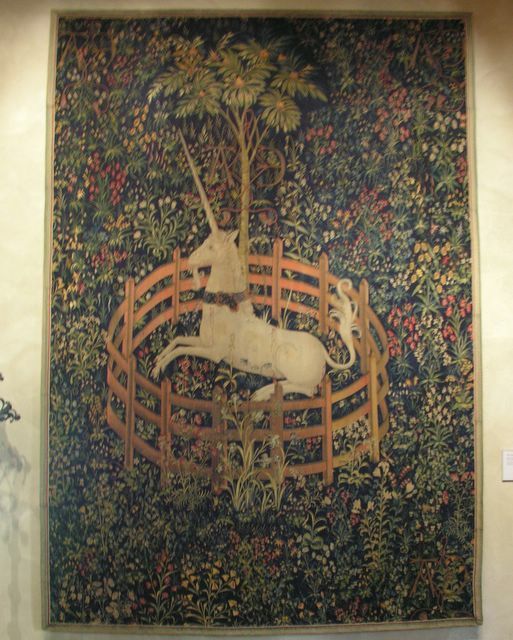 The most famous work in the Cloisters is the Unicorn Tapestries, a series of Belgian textiles portraying a party of nobles hunting and capturing the mythical creature. 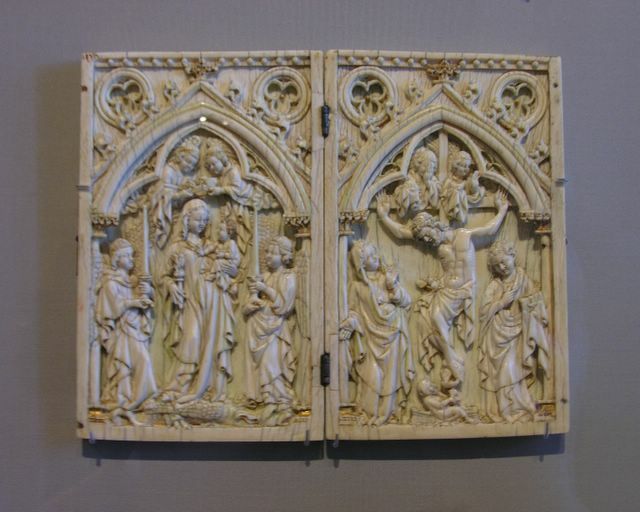 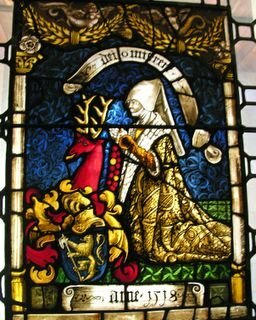 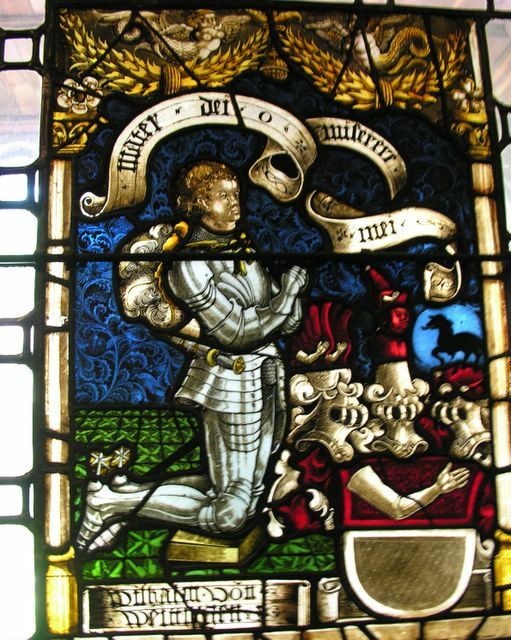 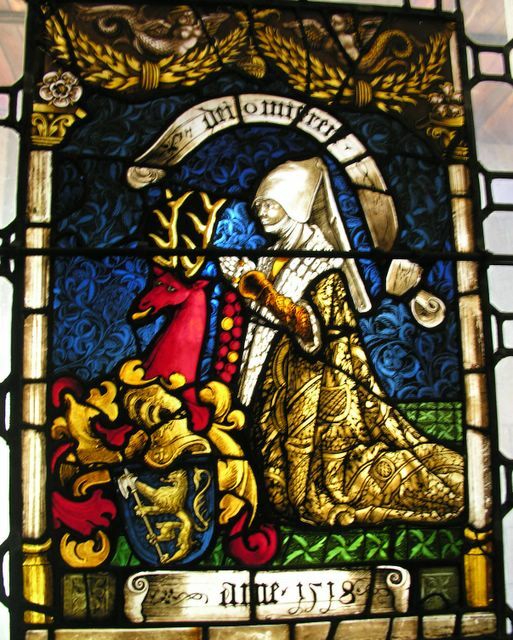 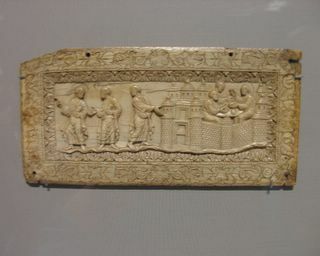 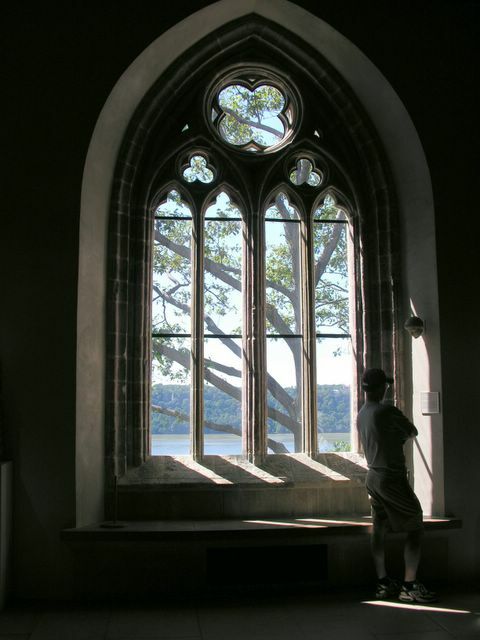 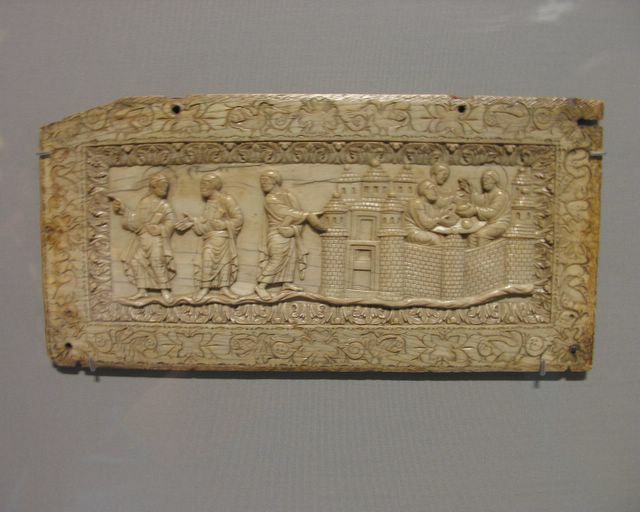 The collection also includes stained-glass windows, metalwork, sculpture, painting, liturgical miniatures, enamels, jewelry and of course, cloisters. 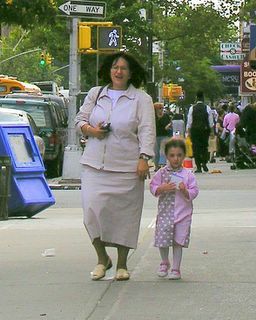 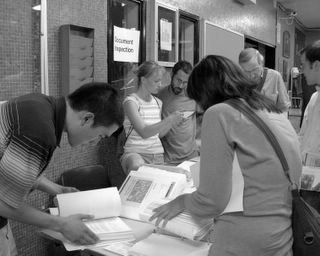 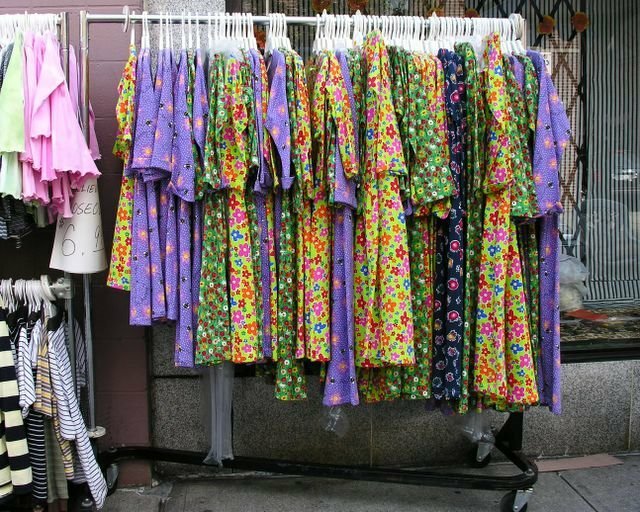 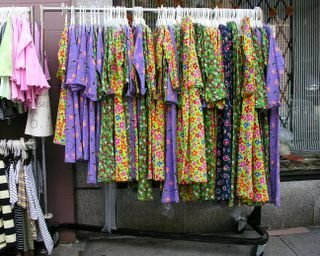 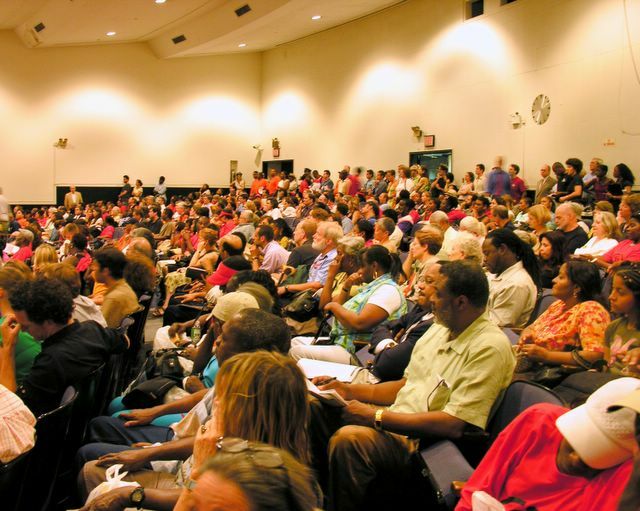 You are currently browsing the Blather From Brooklyn blog archives for August, 2006.